Have you ever wondered if someone�s trying to communicate with you on the other side? Are you looking for proof that there is life after death? Or do you miss your relationship with a loved one who�s passed? If you answered yes to any of these questions, angel communicator and psychic medium Sunny Dawn Johnston is here to help. 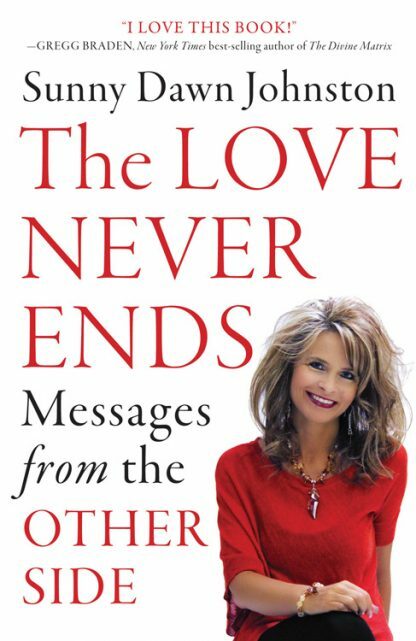 In The Love Never Ends: Messages from the Other Side, Sunny shares a selection of true and amazing stories from her experience helping thousands overcome their fear of death or losing a loved one. A gifted psychic and intuitive, she brings a real and tangible connection between this world and the afterlife�and she says that no matter the client or the circumstances, each person�s story has one thing in common: The love never ends, and fear exists only in this world. Death in this life does not have to mean goodbye forever; we are all eternally connected to those we deeply care for, and we can continue to love, learn from, and grow with our loved ones. This book shows you how. Sunny Dawn Johnston is a bestselling author, speaker, psychic medium and spiritual activist. Sunny has thousands of clients worldwide that refer to her readings, workshops and books as life changing. Her message helps people connect with their heart and release the things that hold them back from being their greatest version of themselves. Combining the unconditional love of a mother and the tell-it-like-it-is honesty of a best friend, Sunny helps people move into a higher vibration of living � and a higher vibration of Being. She lives with her family in Glendale, Arizona.